Moving up in the ranks of the Aura collection, the DK Aura 20” is for that rider graduating to the full-sized class. With a shorter 20” top tube length and lower “stand over” height, the Aura 20” is sized down for smaller riders, but features 20” wheels for real world BMX action. The most affordable 20” bike in the DK line comes in three high impact color schemes and is packed with features that make it look, feel, and ride like it costs much more. 2.3” wide tires offer monster truck traction, and on trend 8.8” bars keep you riding tall. DK grips and PC pedals are a nice touch, and the Wise railed seat is a more significant option than many in this price range. At the heart of the Aura 20”, a high-tensile steel frame, supported by chromoly 3-piece cranks and fork steer tube make for a durable, quality ride at a price that is easy to get a hold on. PLEASE NOTE: We can ONLY ship DK complete bikes to USA addresses in the lower 48 States for free shipping. Canada, Alaska and Hawaii residents- PLEASE contact us for a shipping quote, as we will need your complete address in order to calculate correct UPS shipping! If you are outside the USA, you MUST go through an authorized DK bike shop in your country. While our website will allow you to add this bike to your shopping cart, we CANNOT process any DK bike orders leaving the USA. If you are an overseas customer, and you pay for a DK Bike order, your order WILL be canceled, and your funds will be immediately returned. No exceptions at all. 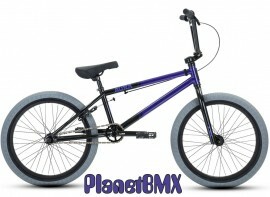 IMPORTANT: To ensure that every component on your bicycle is working properly, PlanetBMX recommends that all DK BMX bicycles be assembled by a qualified bicycle mechanic. Improper assembly of your bicycle may lead to premature wear or failure of individual components. Failure to do so may void the manufacturer warranty.